The cliché that certain crime novels “transcend the genre” is as shopworn as the genre itself can sometimes be. But there’s no disputing that a new generation of crime novelists, many of them women, are rewriting the rules and bringing unprecedented levels of emotional nuance, depth of character, and linguistic elegance to a literary form whose most celebrated practitioners too often depend upon formula and rote. Evoking the works of Ruth Rendell, Kate Atkinson, and Laura Lippman, these page-turning novels are as much driven by the inner workings of their characters and the complexities of their relationships as by standard tropes of the three-act plot structure. 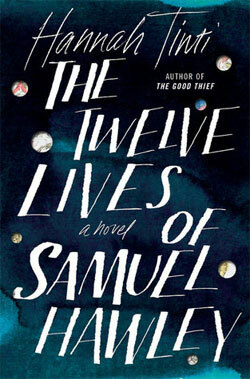 Hannah Tinti is one such writer, and her magnificent The Twelve Lives of Samuel Hawley – a tightly woven braid of gritty noir and coming-of-age innocence – is one such novel. The eponymous Hawley is a man with a past, and that past is written all over his body – literally – in the form of 12 bullet scars. We get a glimpse of that body early in Twelve Lives, Tinti’s second novel following her acclaimed 2008 debut The Good Thief, when Hawley, newly arrived in the sleepy fishing village of Olympus, Mass., strips down to compete in the town’s annual Greasy Pole Contest. Not a man who ordinarily subjects himself to public scrutiny, Hawley does so here in hopes of easing his teenage daughter Loo into community life. Hawley, you see, will do just about anything for Loo, and the urgency of his omnipresence proves both bane and balm to a troubled girl grappling not only with a new hometown but also with the headaches and heartbreaks of young adulthood. Hawley’s scars, we quickly learn, go more than skin deep. A series of flashbacks – one for each bullet wound – reveal his peripatetic journey from petty thief to underworld courier to avenging assassin. Along the way he finds love with the impetuous Lily, Loo’s mother, only to lose her to the sudden violence of a past that, despite Hawley’s Herculean efforts to escape it, shadows him still and threatens to resurface at any moment. So even as Hawley strives to quit running and confect some semblance of a normal life for Loo, he remains the kind of man who keeps his cash on hand, his bags always packed, and his guns ever within reach. As for Loo, her father’s past is as opaque to her as her attraction to Marshall Hicks, an oddball classmate and son of the town’s reviled gadfly. It is the counterpoint of Loo’s halting navigation through the shoals of adolescence – her first crush, her first kiss, her first love – that gives depth and resonance to what might otherwise have been a straightforward tale of crime and redemption. Instead we get to revel in Tinti’s magical melding of the internal and external, of past and present, and of cause and terrible effect. For Hawley, that means accepting his wife’s death and embracing his role as a parent. For Loo, it’s uncovering her father’s baggage and helping him shoulder it. And for the reader, it’s the giddy thrill of surrendering to a master storyteller at the top of her game. For those who might doubt my premise that women are the future of crime fiction, Samuel Hawley ($27, Random House/The Dial Press) stands as a thrilling Exhibit A for the prosecution. Chuck Greaves is a member of the National Book Critics Circle and the author of five novels, most recently Tom & Lucky (Bloomsbury.) You can visit him at www.chuckgreaves.com.